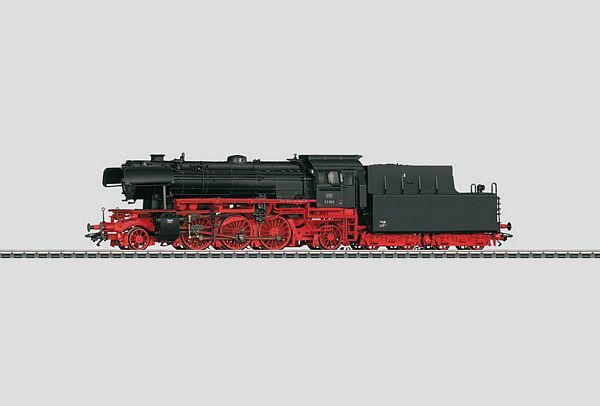 Prototype: German Federal Railroad (DB) class 23 passenger steam locomotive. 2-6-2 wheel arrangement, from the first production run. Built starting in 1950. The locomotive looks as it did around 1959. The boiler bands are the version with black painted metal. Model: The locomotive has an mfx digital decoder. It also has controlled Softdrive Sine high-efficiency propulsion, and a compact design, maintenance-free can motor. 3 axles powered. Traction tires. The locomotive and tender are constructed mostly of metal. There is a close coupling with a guide mechanism between the locomotive and the tender. A 7226 smoke generator can be installed in the locomotive. The headlights are maintenance-free, warm white LEDs. The triple headlights change over with the direction of travel. The headlights and the smoke generator contact will work in conventional operation and can be controlled digitally. The front of the locomotive and the back of the tender have a close coupler with a guide mechanism and an NEM coupler pocket. The locomotive has a different road number from that for item no. 39230. Minimum radius for operation is 360 mm / 14-3/16. Separate parts for brake hoses and piston rod protection sleeves are included. Length over the buffers 24.5 cm / 9-5/8. Especially well detailed metal construction. Compact design Softdrive Sine high-efficiency propulsion. Different road number from that for 39230. The Class 23. Right after World War II the new German Federal Railroad still had to rely on steam motive power. Henschel developed the class 23 to cover the demand for passenger and lightweight steam locomotives. The 105 units built from 1950 to 1959 had a 2-6-2 wheel arrangement and were equipped with a welded frame, boiler, and tender. The maximum speed was 110 km/h / 69 mph forward and 85 km/h / 53 mph in reverse, which was enough to equip several locomotives with shuttle train controls. These locomotives performed their task without a great deal of fanfare in the areas of service planned for them. On January 1, 1968, the class 23 was changed to the computer designation class 023 and the last units of this class remained in service on the German Federal Railroad network until 1976. During this period they were assigned to the Crailsheim District. Road number 23 105 also wrote German railroad history. It was the last German Federal Railroad steam locomotive put into service, which lent it museum status. However, it was a victim of the catastrophic fire on October 17, 2005 at the Transportation Museum in Nurnberg, where it was heavily damaged. There are several examples of the class 23 preserved as museum locomotives, some of them even operational, due to the good condition of all of these locomotives, when they were retired from regular service. This model can be found in a DC version in the Trix H0 assortment under item no. 22231.